I love Le Creuset and would love to own some cookware from them! "All-Clad" Cookware followed closely by "Le Creuset" and "Lodge" Cast-Iron pans. I can never stick with just one. I am already your "Google reader" follower..
Nice giveaway:)I like Cuisinart cookware sets. All-clad always catch my attention, but since I am trying out things from "Mastering the art...", Lodge's dutch ovens are my fancy these days. Thank you for this wonderful giveaway. I am in dire need for new pots., I love All clad, Calphalon and Le Creuset brands. I also subscribe you via email. Oh , and I also follow you on google reader. I get your feed via reader. I have recently started loving the stainless steel ones from Calphalon..
Hey and I am your follower from a loooong time!! LeCreuset and All Clad are my favorites. I love my cast iron skillet and my Descoware enamel-coated cast iron Dutch oven. I subscribe in my RSS reader. Cute looking Ramekins and a springform tin are on my wishlist for quite some time. And looking at those pans make me wanna expand my wishlist! they r very easy to use and good to cook..
My favorite has been T-fal for ages, but I'm ready to try something new. I would love to buy All-Clad cookware. Also like u on FB!! My dream cookware is Le Creuset - but on an everyday basis, I love copper cookware and heavy bottomed pans. Unusually shaped vessels score too. Nice set of pots there Divya. I just love cookware and anything that would make the kitchen look beautiful and cooking interesting is welcome. Steel cooking pots are my current favorite. Loved your Divya times, looking forward to more on that. I come from my blog hibernation and I see this cookware giveaway :-) My fav cookware is Le Creuset though they are pretty expensive !! I am already following you publicly through google.. I would love to have a Le Creuset or All- clad cookware!! Awesome giveaway...Am already ur follower..
Teflon- Stainless Steel Cookware..Looks so elegant..
Also i too have a CSN giveaway event going on my blog......will be glad if u can participate..
All Clad hands down for me. One of these days..when i win the lottery - the first thing I would buy on the way home is a complete All Clad cookware set! My favorite cookware- my cast iron skillet- pretty much everything gets cooked in it!! am already your fan on fb as well as being a follower, to win this...i'd do anything...Lovely set of pots and pans...can't wait for random.org to pick me up!! Oh wow! My favorite cookware is my cuisine art mini blender/hand mixer/ egg beater thing. I love the chopper attachment and use it for chopping onions. It is so easy to clean. My current favorite in my kitchen now is a heavy cast aluminum skillet I bought for $5 in a market in Santa Tecla, but it is staying when I move to Colorado in 6 weeks. I'm dying to get my hands on a cast iron skillet and dutch oven. I like hard anodized pans and stainless steel and aluminum pans. Never thought of copper pans though. SOunds interesting. Would love to have them. I am in. My favorite cookware store is definitely Le Creuset and Sur la Table! Divya, so glad to have met you too, you have a great blog going, added you to my reader. Take care btw I own few "Le Creuset" and I love them, wouldn't mind few more. Awesome give away!!!! love copper pans!! Hai, I am ur fan in fb and collecting recipes thro email. 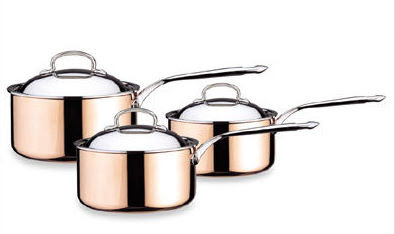 My favorite cookware is All Clad -- I love the balance of the pots, and their weight and beauty. I liked your facebook page (Rusthawk). I am subscribed to your site in google reader. You have an award waiting in my blog... Pls collect it.. I like Farberware cookware best. I definitely love All clad, & Le Creuset the best! Thank you for such a wonderful giveaway! Love to follow your posts....more so now! my fav is calphalon cookware set. i follow ur blog in google reader. my favorite pan sets are the ones by rachel ray. for the doodh peda query... U can buy milk powder in indian store... or u get low fat dry milk in ralphs.. u can even buy that.